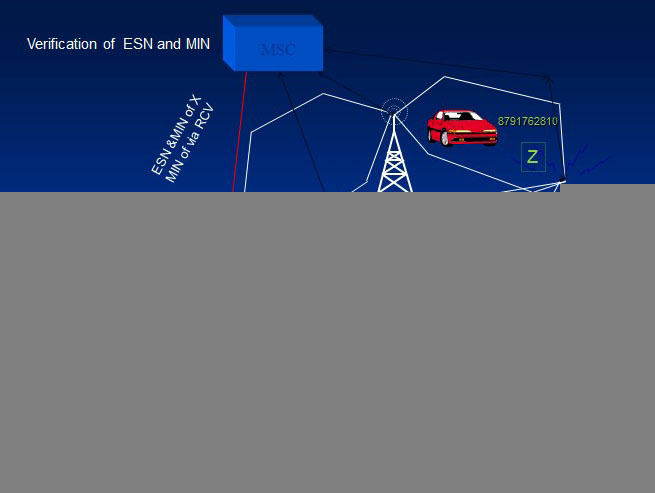 When a telephone call is placed to a mobile user, the MSC dispatches the request to all base sattions in the cellular system. The MIN (Mobile Identification Number,which is the subscriber telephone number,is then broadcast as a pagingmessage overall of the forward control channel through out cellular system. The mobile receives the paging message sent by the base station which it moniters,and responds by identifying itself over the reverse control channel. 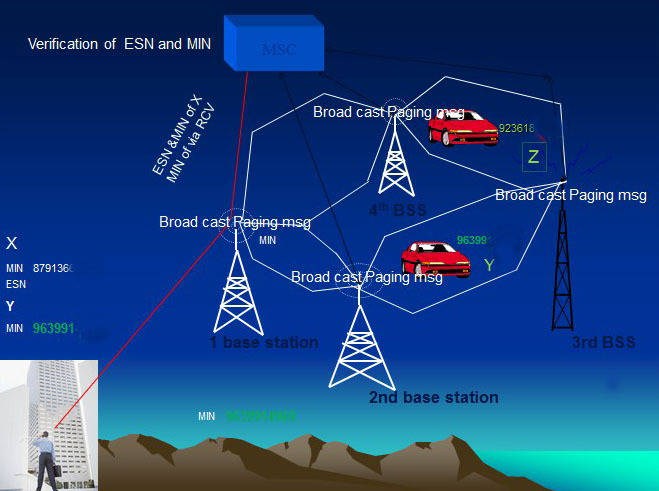 The base station relays the acknowledgement sent by the mobile and inform the MSC of the Handshake.then,the MSC instruct the base station to move the call to an unused voice channel within the cell(typically , between 10 to 60 voice channels and just 1 control channel are used in each cells base station).Now the Base satationsignals the mobile to cahnge frequency to an unused forward and reverse voice channel pair,at which point another data message(called an alert)is transmitted over the forward voice channel to instruct the mobile telephone to ring,thereby instructing mobile user to answer the phon . Al of these events occurs within a few seconds and are not noticeable by the user. With the help of below pictures you can easily understand the concept ,here we are assuming that a user X want to call his friend y. Once a call is in progress, The MSC adjusts the transmitted power of mobile and changes the channel of the mobile unit and base station in order to maintain call quality as the subscriber moves in and out of range of each base station.This is called a handoff.Special contol signaling is applied to the voice channels so that the mobile unit may be controlled by the base station and the MSC while a call is in progress. 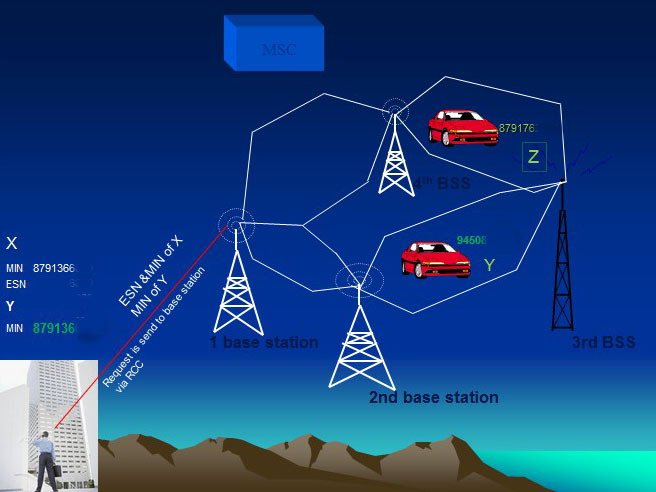 When a cellular phone is turn on,but is not engaged ina a call,it first scans the group of forward controle cahnnels to determine the one of the strongest signal,and then moniters that control channel until the signal drops below a usable level. At this point, it again scans the control channels in search of strongest base station signal. When a mobile originates a call,a call intiation request is sent on the reverse control channel. With this request mobile unit transmits its telephone number(MIN) ,Electronic Serial Number (ESN), and the telephone number of the called party. Yhe mobile also transmits a Station Class Mark (SCM) which indicates what the maximum transmitter power level is for the particular user . 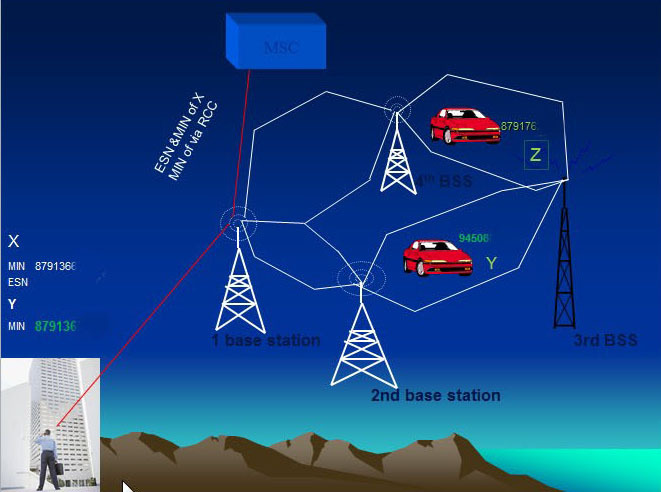 The cell Base Station receives this data and sends it to the MSC. The MSC validates the request, makes the connection to the called party through STN,and instruct the base station and mobile user to move to an unused forward and reverse voice channel pair to allow the conversation to begin as shown in figures.